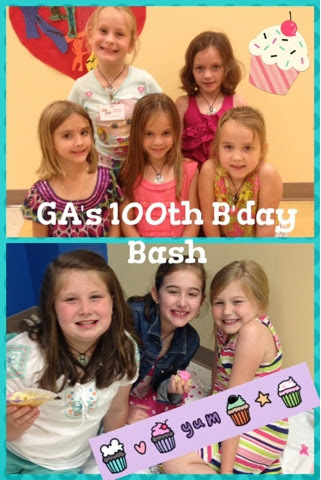 Wednesday night we celebrate the 100th Birthday of GA's! We were suppose to have an outside party but the rainy weather took care of that for us so we partied inside! I teach the first graders so those are my little friends at the top and the bottom is Brylee and some her friends celebrating in her class! 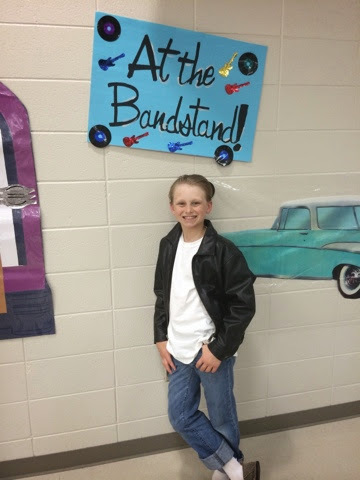 Jackson had a end of the year 5th grade performance tonight! It was 50's theme and they all had to dress up and they sang some cute songs from that era! It was a cute! 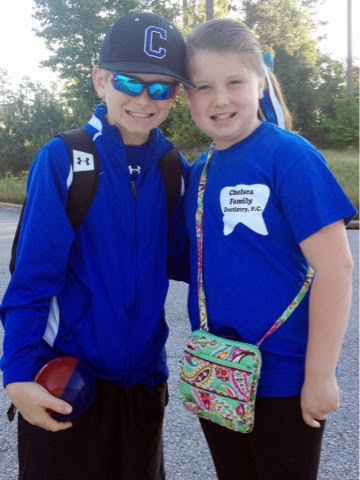 Today was field day for Jackson and Brylee is was unseasonably cool but they still had fun filling up on junk, playing games, and jumping in the inflatables! The Powers kids brought home some hardware today! Brylee has her end of the year team party this afternoon and got her first softball trophy! Jackson and his team brought home the big guns... 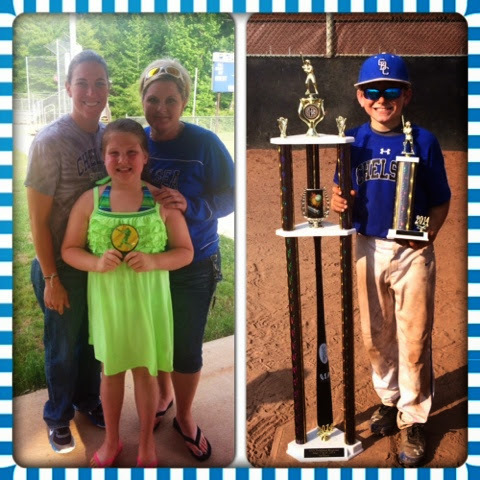 They won their tournament and brought home a first place trophy! 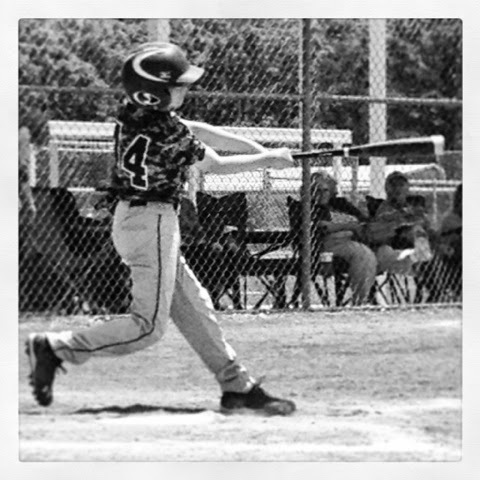 They won their first game 9 to 0 and then beat the team we lost to on Saturday 14 to 5 in the championship game! Go Chelsea Blue!!!! Proud of my babies!!! But not tonight.... These last few days of school have been crazy busy... It's always like that at the end of the year so much to do so little time! 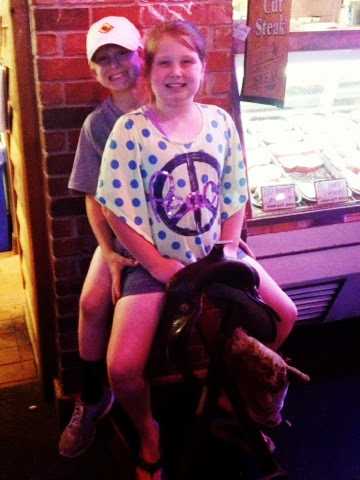 Today was nuts at school so there was no cooking going on in my house tonight it was a Texas Roudhouse kind of night!!! Tuesday, May 17th: Jackson's 5th grade awards day!!! 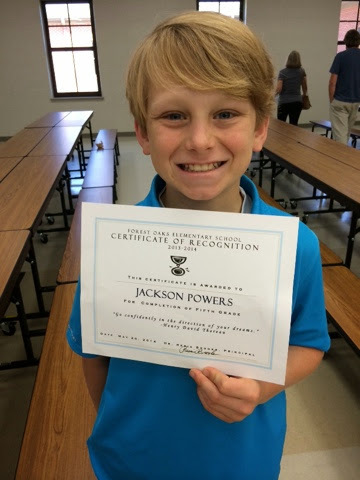 Thankfully daddy was able to scoot away from school and come in late that morning so he could go see Jackson's awards day! Honestly, I can not believe Jackson is finished elementary school... It's seems like yesterday he was just starting!!! 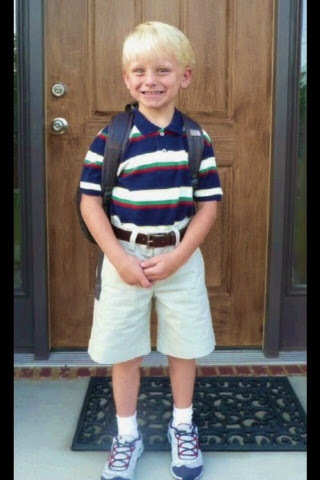 My little sweet thang on his first day of Kindergarten! Gosh they really do grow up before your very eyes... FAST!! !